O.J. 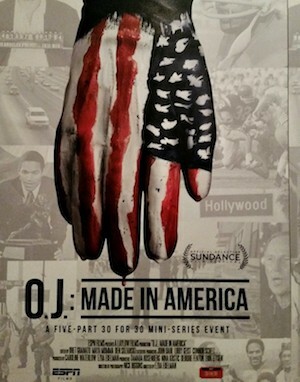 : Made in America is a five-part documentary produced by ESPN as part of its 30 for 30 series. This new documentary series comes on the heels of the popular and well received reenactment series The People v. O.J. Simpson: American Crime Story. Twenty years later, and it seems we still cannot get enough O.J. The series has received universal critical acclaim from critics. Currently the series is rated 95 on Metacritic.com. The O.J. Simpson: Made in America documentary series airs in Canada on CTV, premiering Saturday, June 11 at 9/8C. Visit the show page on CTV.ca to learn more. Update: O.J. : Made in America is now available on CraveTV.